Fly-in hunting and fishing camp in Northern Quebec High North Outfitting fly-in hunting and fishing camp in Quebec. 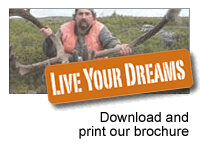 High North Outfitting is a small scale fly-in hunting and fishing camp located on Lake Dufreboy in the Ungava Bay Region of Northern Quebec and offers first class, fully guided, American Plan Adventures. MOVED TO GREENLAND FOR MUSKOX & CARIBOU !!!! Whether you are in search of "World Class" Caribou, Fishing for Trophy Lake Trout, Arctic Char or Brook Trout, upland game hunting for Ptarmigan, a venue for a corporate outing or a relaxing family holiday, High North is more than happy to help with all the fine details involved to ensure a trip of a lifetime. Kevin Mattice has as much outfitting experience if not more than any other current outfitter operating in Ungava, Quebec. He runs a hands-on operation and is the only outfitter that is actually at his camp and guiding on a day to day basis. He has the only operation that IS NOT a "high volume" outfit. There will be only 8 hunters per week and Kevin is present at camp during the duration of your stay. His success in the past 15 years is higher than any other outfitter for the plain and simple reason being he can focus on you and you alone. He does not have 10 or 20 other camps to worry about. Guests of High North Outfitting are priority number one and is the reason for such high repeat business. Bottom line, we at High North Outfitting are offering a professional, personalized service. It was definitely a hunt of a lifetime.